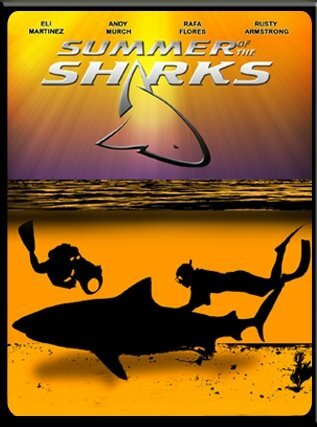 Summer of the Sharks is a documentary/road trip film by Shark Diver Magazine Editor Eli Martinez. The film follows the progress of two shark divers; Eli Martinez and Andy Murch. Eli came from the adrenalin charged rodeo circuit. After sustaining an injury while riding bulls, he learned to dive and immediately gravitated towards shark diving. Eli started Shark Diver Magazine and became friends with photographer Andy Murch who was on a similar path. Eli ultimately decided to bring his passion to a new audience by producing a feature length film about a typical summer in the lives of the two adventurers. Summer of the Sharks follows four friends Eli, Andy, their shark diving friend and RV driver Rafa and camera man/ film editor Rusty Armstrong. Leaving Texas, the boys visit sharky destinations all over the US and St Maarten and the Bahamas to dive with and photograph sharks. Over the course of the summer they meet many other shark fanatics and get more than their fair share of shark action. Eli's obvious passion for adventure shines throughout the movie as he collects new shark diving experiences. Andy, is more focused on getting the shot. The characters play off each other well and the movie has a feel good theme of light hearted camaraderie in a sport that both characters are obsessed with. Will it be good or bad for sharks? Summer of the Sharks shows the edgier side of shark diving that many operators frown upon. However no one gets hurt and there is a clear message that beyond the thin veneer of shark tourism, many sharks are being over exploited for their fins. The film contains graphic footage from Holbox Island in which tiger and bull sharks are brutally clubbed to death on camera.